This is just an example! Just a sample template. I hope it is useful but don't just use it blindly. If it's right for you then great; but if you want to adapt it, simplify it, expand it then you should of course do so. ... What this does mean is that I don't allocate 1,2,3 etc and thus this particular template doesn't have an 'overall risk' column where you multiply the Likelihood by the Impact; e.g. if you had a High Likelihood (and score it 3) and a High Impact (also scored 3) then multiply them together which gives you a simple 'risk factor' of 3x3 = 9. Some people like this sort of approach. The Response column: is very Prince, so if you want to adapt that then go ahead. 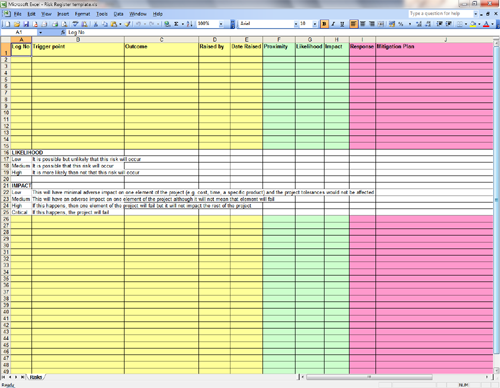 Colours: I have added different sets of columns in the spreadsheet in different colours just to show a bit of structure. But once you get going you might want to make all columns the same colour and use a colour traffic light system for the individual rows. And of course: there are many other ways of listing, recording and managing risks, and the risk register (and any template) is thus just one aspect of this. My way isn't necessarily best. There are many good ways of managing risks. And it won't make you a risk management guru overnight! I hope this helps. If you have any questions or ideas/suggestions then please do add them in the Comments below. Hi Ivan, a very useful template! All seems easy to follow, however not quite sure what you mean by "Proximity" (column 'F'). Proximity really means when the risk might occur; e.g. Feb 2015, Between Feb and May, Design phase etc.